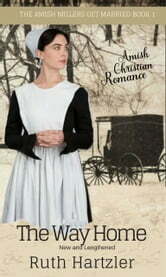 This is a full length novel, the lengthened and rewritten version of the award-winning and best-selling Amish Christian Romance novella, The Way Home. When Noah Hostetler while on rumspringa loses control of a borrowed car on an icy road and drives into a buggy, the Miller sisters are hurt. Injured and with unforgivingness in her heart, Hannah Miller vows she will never again feel for Noah what she once did—a deep and loyal love. Both Hannah and Noah believe that with God’s grace anything is possible, but healing from a painful past is no easy task. Can Hannah rediscover what once she felt for Noah before his terrible mistake, or will her heart remain closed to him forever? I so enjoy this book. Such a wonderful reminder that we must always lay our concerns, fears and anxieties at God's feet.